After an RSS email campaign starts sending, you may want to change the layout, your logo, or even the RSS feed being used. Pause your RSS campaign to make edits, and resume it when you’re ready to start sending again. In this article, you’ll learn how to pause and resume your RSS campaign. Here are some things to know before you start the process. Make sure you’re familiar with how RSS campaigns work in Mailchimp. Paused RSS campaigns queue posts from the time that they're paused until sending is resumed. For example, a daily campaign that’s paused on Monday and resumed on Friday would include any posts made on Tuesday, Wednesday, and Thursday. Frequently pausing and reactivating an RSS campaign may interfere with Mailchimp's ability to queue the campaign for sending. If a campaign has recently been resumed, it may take a day for the RSS campaign to send again. To pause your RSS campaign, follow these steps. Find the RSS campaign you want to work with. If your campaign hasn't started sending yet, click the Pause and Edit button, then click Pause in the pop-up modal. 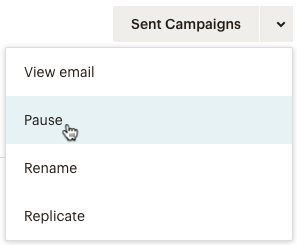 If your campaign has started sending, click the drop-down menu and choose Pause. Nice job! After the campaign is paused, it will open to the Confirm step with a paused for editing success message across the top of the page. Continue through the RSS campaign builder to make your changes and resume sending. If you want your campaign to remain paused, click the Save & Exit drop-down on the top right of the screen and choose where to go. To resume your paused RSS Campaign, follow these steps. Click the name of the RSS campaign you'd like to resume. Navigate to the Confirm step, then click Start RSS. In the Confirm RSS Start pop-up modal, click Start Campaign. Nice job! We’ll send your RSS campaign at its send time when there’s a new post on your feed. Learn how to troubleshoot your RSS campaign.